Fiction – paperback; Vintage; 289 pages; 1999. 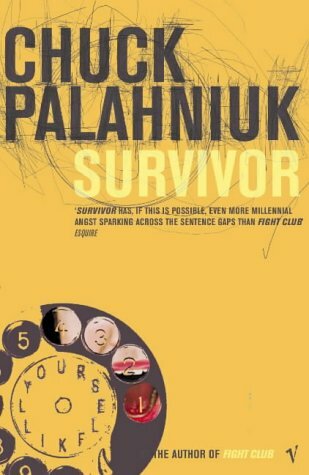 Survival is typical Chuck Palahniuk fare: surreal, outlandish and completely over-the-top. This oh-so brilliant satire on fame and religion is a gripping read from the first word. Tender Branson, the last surviving member of the Creedish Cult is at the helm of a plane about to crash over the Australian outback. Into the plane’s black box flight recorder he tells his freakish tale: how he escaped the clutches of his repressive cult by becoming a hired servant in an equally repressive household; how he found himself accidentally responsible for manning a I-can-help-you-commit-suicide-phone-line (I told you it was surreal); how he became caught up in a comedy of errors that saw him transformed into the new messiah. This weird and bizarre story is savagely funny from woe to go. The writing, hypnotic and lyrical, has that same beautiful rhythm that characterises all of Palahniuk’s novels. It’s brash, laugh-out-loud-funny and an enormously unconventional novel I couldn’t recommend highly enough. I am reading Haunted, his latest, right now and it is really dark and strange. I’m almost half way through and I’ve been led to believe it gets more disgusting as it goes. So far, it’s disturbing, but not really out and out gross. If I survive this one, I will certainly check out Survivor based upon your recommendation. JoanneMarie, most of Chuck Palahniuk’s novels are “really dark and strange”. I am very much looking forward to reading “Haunted” when it comes out in paperback. Out of all his books that I have read, I think I liked “Diary” best.